This is the third in our series on financing the clean energy transformation. The first part explores the cleantech bubble of 2011. The second part asks, How are we going to fund the clean energy future? 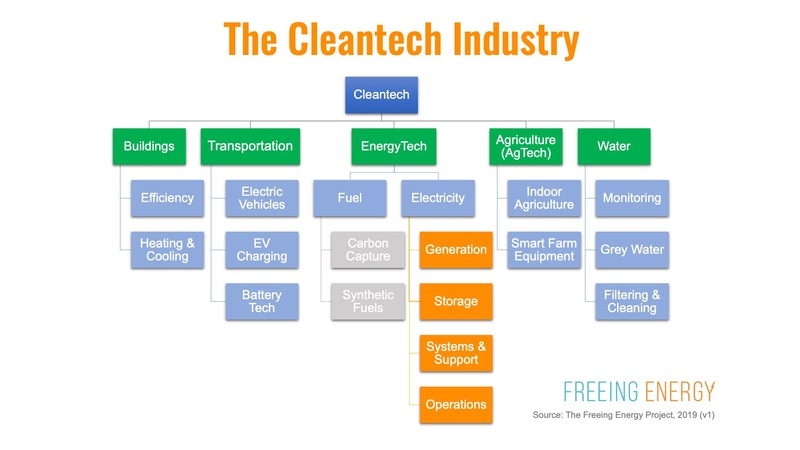 In this third part, we’ll take a look at the major segments within cleantech and show where clean energy fits in. A definition: what exactly is cleantech? … any process, product, or service that reduces negative environmental impacts through energy efficiency, the sustainable use of resources, or environmental protection activities. But this is more than sustainability for its own sake. The “tech” part of “cleantech” implies disruptive solutions and lower costs. It also implies the high-growth characteristics that attract venture capitalists and other early-stage, higher-risk investors. Transportation: electric vehicles (EVs), EV charging, and battery storage. Buildings: energy efficiency like LEDs, insulation, and improved HVAC. Agriculture (AgTech): indoor agriculture, smart farms, and plant science (more). Water: Greywater treatment, monitoring, and filtering (more). Energy (energytech): fuels and electricity. Synthetic fuels: creating fuels from solar, thermal, or biologic mechanisms. Examples include algae to oil, recycled plastics to oil, and solar to hydrogen. Carbon capture: removing carbon dioxide from fuel combustion processes or directly from the air. Examples include: sequestering CO2 underground, capturing CO2 from advanced combustion cycles, and finding commercial applications for excess CO2. Generation: solar and wind power, geothermal, and many others. Nuclear is often included in this segment, too. Storage: batteries, mechanical storage, and long duration storage. Systems: hardware and software systems that enable the next generation of clean, distributed grid. This includes areas like microgrids, EV charging, and inverters. Operations -> Financing: providing the capital to build companies and infrastructure. It includes marketplaces, crowdsourcing, and pay-as-you-go (for low-income regions of the world). Operations -> Optimization: demand response, peak shaving, analytics, and wind turbine management. This partially overlaps with buildings and microgrids. Operations -> Maintenance: analytics, drones, predictive maintenance, etc. This is also referred to as “operations and maintenance” or “O&M”. What are the biggest opportunities for reducing CO2? Reducing CO2 is a key goal for cleantech. This chart from the Rhodium Group gives a sense for the trends and relative contributions from several major industries. In his widely read book, Energy and Civilization, Vaclav Smil makes the case that capturing and utilizing energy has propelled humanity forward more than any other idea or technology. Energy is the foundation of nearly every part of our modern society. The coming decade will see more change than the industry has seen in a century. The opportunities for investors are enormous. The fuel-side of energytech has lagged electricity but that may change. Rising concern over CO2 emissions has pushed governments around the world to explore “carbon pricing”. This can take the form of “cap and trade” and the more politically charged “carbon tax”. As more governments embrace this, fuel-based energytech revenue and investing will skyrocket. Meanwhile, the Freeing Energy Project focuses almost entirely on powertech, the electricity part of cleantech. The reasons are simple. The power industry has been sheltered by government-granted monopolies for over a century. The lack of competition has slowed innovation and left the industry decades behind others in terms of digital technology, new business models, and dynamic marketplaces. A host of new technologies and business models are conspiring to upgrade the power industry. It’s likely these changes will come so fast that the regulators and current leaders can’t keep up. A full-blown disruption will result and the scale of impact may be larger than almost any industry before it. Epilogue: during my research, I was surprised how little had been written on segmenting cleantech. So, I did it myself. I welcome feedback, suggestions, and debate. Fuel cells don’t get a mention in your chart, and you have previously said that they are too expensive. I’m sure that you remember when solar was too expensive. A household must use about as much energy as a forklift, and there are fleets of forklifts, running on hydrogen fuel cells, methane fuel cells, and methanol fuel cells. If fuel cells are already economical for forklifts, how can they be too expensive for you to consider? Admittedly, fuel cells don’t fit easily into your chart, since they would appear in Buildings, Transportation, and Energy Tech.